Headlines this O-week were grabbed by the LAME group "Resistance". Resistance as part of its campaign to support freedom of expression and civil liberties is offering flag burning kits during O-Week activities and beyond. The kit is inspired by Resistance member Azlan McLennan's recent artwork "Proudly un-Australian", which was censored by police when it was removed illegally from its Footscray gallery. "Proudly un-Australian"? Are you sure you don't mean ashamed to be Australian? I note that on their website they don't have any Danish cartoons? So much for "support(ing) freedom of expression and civil liberties…"
Grandstanding of this nature is infantile and actually serves to alienate them more and more from "mainstream" Australians. Surely this would be the last thing they would want…? Well, listening to Hack on JJJ this Tuesday afternoon (a great show to get annoyed by), I heard an interview with one of the main culprits. There was nothing other than what I could describe as "glee" in his tone of voice when discussing burning the flag. He let the cat out of the bag. He wants to be alienated and disliked. It was clear that his real motive was to achieve the personal satisfaction he feels when "everyone's against me man". Bringing a debate down to this level (i.e., no debate) is simply a non-verbal/textual form of Argument by Slogan. It is somewhat ironic that, as it turns out, there are instructions with the flag burning kit… Instructions??? Sorry, what part of using a lighter don't you understand? Surely no-one is that stupid… Oh, they bought it, of course they are. My bad. As a fellow free speech advocate I decided to visit your site in solidarity. I was left somewhat perplexed, however, by the lack of discussion, or rather, position apropos to the recent “Danish Cartoon Controversy”. Surely this is the biggest free speech issue at present? 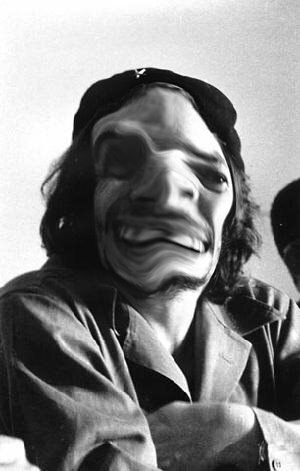 Update 2: Pictured - A botched attempt (by the same bloke responsible for this) at a facial transformation on a resistance member (attempting to augment his physical appearance - to show his super-duper extra, so much more "solidarity" than you, attitude - by looking like icon Che Guevara - a "guevara-o-plasty").